Were you “Sleeping” on this one? 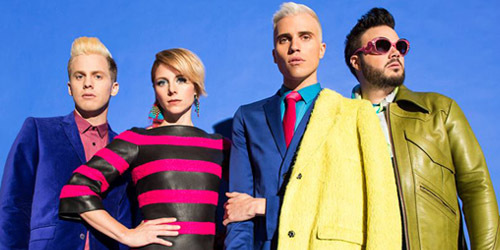 After ruling my chart for four weeks in 2010 with “Animal”, the Utah quartet led by Tyler Glenn cooled off a bit as their next four singles, two from 2010’s Habits and the two from 2012’s Picture Show, all failed to break into my top ten. By the fall of 2013, things came to a halt once again when Glenn posted a frustrated social media rant regarding the executives responsible for the group’s artist development deal. It could’ve been pretty ugly. Luckily, they came back with a pretty great song, a tune that took them to the top for the second time. “Sleeping” was an instant impact record on the countdown when it debuted at #39 during the second week of January, hitting #1 in its eighth week on the chart. Though it logged six weeks at the top, two weeks more than the run for “Animal”, it quickly fell and lacked in the longevity department. However, at 26 weeks, it did manage to spend half a year on the survey. 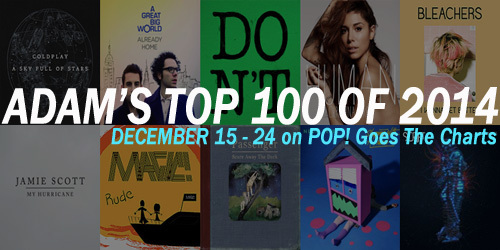 Its chart peaks nationally in both the U.S. and Canada were not as notable, though it did rank on five distinct radio format lists. Though the Pop Psychology era was derailed over the summer by a last-minute single change (“Love In The 21st Century” to “Text Me In The Morning”, which ultimately bombed) and a lightly promoted third single, “First Things First”, the Trees still grew their roots and their audience in the States. The album did go top ten upon its debut. The new year may not be the most active one for the band on the charts, but I’m sure that neon will be glowing even brighter soon.